While public transportation agencies across the country sent their best and brightest to Atlanta, the weather failed to get the memo. And yet, despite torrential downpours and tropical storm-like conditions, this year’s APTA turned out an incredible number of transit advocates, agencies, consultants, and more! In light of APTA’s focus on safety, resources, workforce development, demographic shifts, and technological innovation, the Annual Meeting was saturated with knowledge, ideas, and communal brainstorming. 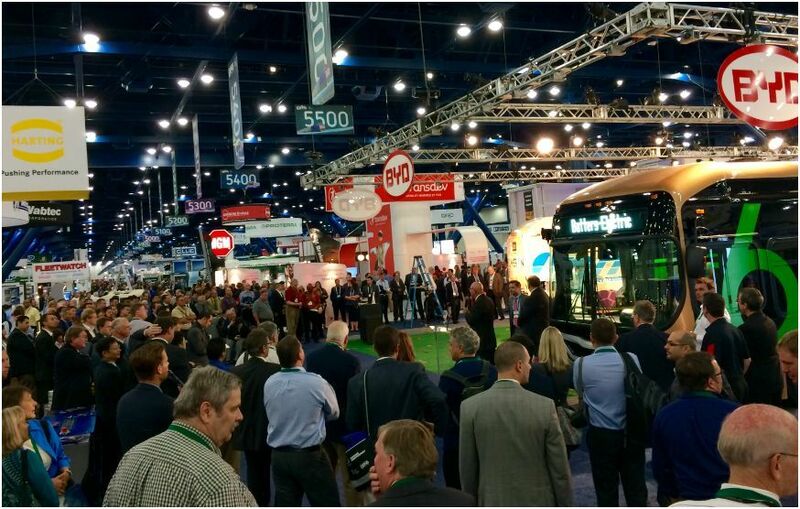 To glean what knowledge we could about the state of public transportation is today—pain points, concerns, desires, etc.—TransLoc sent a team of our microtransit experts to the events. Here is our shortlist of takeaways gathered from the sessions, conversations, and observations held at APTA 2017. From low-income communities to the elderly and disabled, providing equitable transit options can be both challenging and costly for agencies. Yet, while at APTA, we kept hearing that providing equitable transit to is a priority that cannot be overlooked. Whether it’s finding new ways to use existing resources or planning for a different application of fixed routes to serve more communities, agencies are putting their heads together to provide modern and equitable transit options for those that need it most. Some days it seems like corporations and local employers are either your biggest fan or your whiniest neighbor. Developing partnerships with the local chambers of commerce and other local organizations is the first step toward establishing open channels of communication and negotiation. Many employers will help pay for transit improvements or technology pilots, put together grant proposals, or organize and implement TDM programs that subsidize rider costs or provide other perks to encourage ridership. Keeping up with ridership data, learning new technology, and competing with TNCs can be a transit nightmare, but all of it is critical to staying afloat in today’s mobility-focused world. Transit employees and executives all around were commenting on a need for innovation, a change in focus, and a shift in priorities in order to transform the current systems to meet the needs of riders today and into the future. The answer? Microtransit. Bus, shuttle and rail operators are a dwindling valuable resource, and working alongside unions to protect their needs is a high priority. However, agencies are understaffed due to low numbers of operators being available, a challenge that needs to be solved in order to see real improvement on all fronts. Improving operator satisfaction, encouraging bus operator career paths, and planning more efficient schedules are also on the docket as potential solutions. Among the many topics discussed at the Annual Meeting was how to find funding for Zero-Emissions Buses (ZEBs) and considering alternative transportations like mobility-on-demand and high-speed rail. Sustainability is a glorious and ever-present ideal, especially for transit agencies, but helping push sustainable initiatives in a scalable system isn’t exactly simple. Solving for this requires an innovative approach, having an open mind to partnering with technology providers, and a willingness to take some chances. The first-mile/last-mile dilemma continues to plague transit. Unfortunately, there are many people who do not have access to transit within walking distance (¼ mile in the U.S.) or cannot sacrifice the convenience of their personal vehicle to take a longer trip to get where they’re going. Enter: rider-focused transit agencies. As one presenter said, agencies must transition from transit provider to mobility provider. This transition doesn’t happen overnight, but taking the first step towards mobility-on-demand is risk-free with new simulation technology that allows agencies to evaluate possible plans for first-mile/last-mile solutions. Other good moves? Partnering with multimodal advocates and mobility-on-demand technology providers to help close the first-mile/last-mile gaps. Everywhere we looked it seemed like the big question was what to do about decreasing ridership. Riders’ needs are changing, there is no doubt about that, but public transit agencies’ role in providing mobility options is becoming increasingly more important NOT less. Focusing on increasing ridership and decreasing costs is not a question of putting more butts in seats (although that would be ideal), but instead a question of mobility strategy and innovation. How do you reach riders where they are and provide what they need without exponentially increasing costs? By using in-house resources, agency-owned microtransit technology, and addressing the real-life numbers to build a strategy that works for your community.